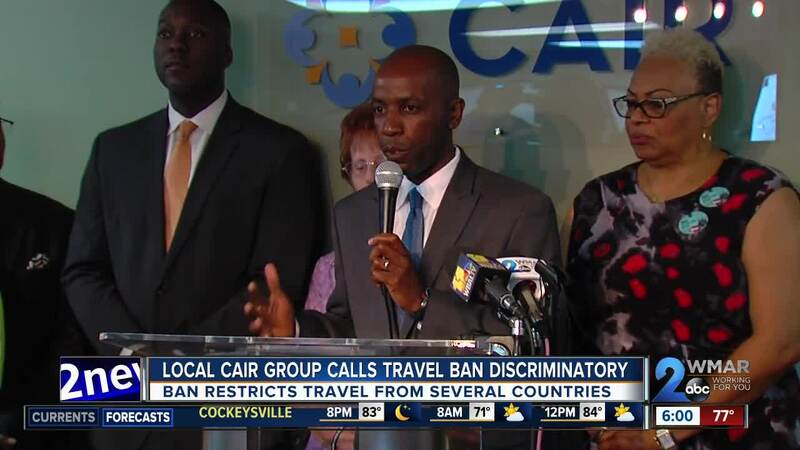 Representatives of several immigrant rights and social rights groups held a press event at the Maryland Office of the Council on American-Islamic Relations to condemn the recent Supreme Court ruling upholding President Donald Trump’s Administration’s ban on travel from several predominantly Muslim countries, vowing to continue their fight against what they see as prejudicial policies. The 5-to-4 decision, divided along the court’s party lines, maintains the travel restrictions are within the president’s executive jurisdiction, and that his remarks on the campaign trail that spoke to a potential religious or ethnic animus behind the policy did not preclude such executive authority. Rizwan Siddiqi, President of the United Maryland Muslim Council, urged Governor Larry Hogan to make a statement against the ban. “As an American I am absolutely horrified by this administrations reliance on trumped national security concerns to justify all manner of cruelty, race-based religious persecution at the border,” Bobbie Monahan, of Indivisible Baltimore, said in reference to the administration’s claims that the new travel policy, and the recent controversy surrounding children being separated from their parents at the country’s southern border, are validated by an overwhelming national security concern. Aban Jones, a young man who immigrated from the African nation of Chad, a country on one of the first iterations of the travel ban, spoke of the pride he felt in graduating high school, and the sadness his family experienced when his grandmother, a Chadian national, could not come to the U.S. to attend his commencement ceremony. Howard County Councilman Calvin Ball added a historical perspective in his remarks, speaking about children reading history books in school, and what those future history books might say about our current times if policies like these persist. Also conjuring history, Naveed Ahmed of the Islamic Circle of North America, introduced a campaign in support of U.S. House Resolution 869, which recognizes the contributions of American Muslim’s to the history of the country. He compared the Islamic communities ties to the nation’s growth with those of other celebrated ethnic groups like Italians and Irish. The overwhelming message from the press conference was that these impassioned groups will not let this Supreme Court decision be the end of their fight. They vowed to remain ardent advocates for the oppressed.